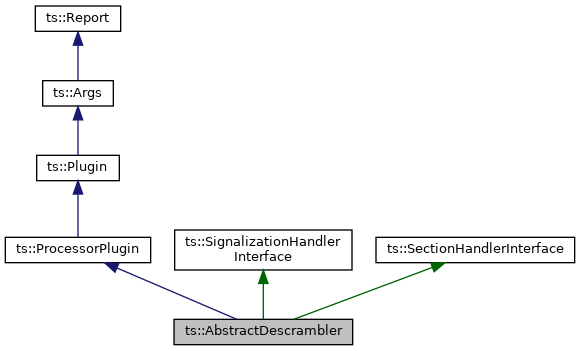 Abstract base class for DVB descrambler plugins. 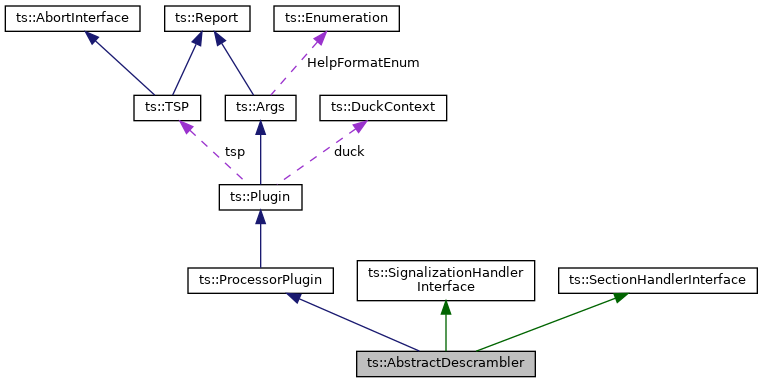 [in] stack_usage Stack usage for asynchronous ECM deciphering. Check a CA_descriptor from a PMT. Must be implemented by subclasses (concrete descramblers). This method is invoked by the superclass when a CA_descriptor is found in a PMT. Verify that the CA_system_id is compatible with the concrete descrambler. Optionally verify that the private part of the CA_descriptor is compatible with, for instance, the capabilities of the smartcard. Example: A CAS may set an operator id in the private part of the CA_descriptor and the smartcard may have returned the list of operators during initialization. If the smartcard cannot manage any operator in the CA_descriptor, this ECM stream is probably for another operator and the descrambler should ignore it. [in] priv Private part of the CA_descriptor. True if the descrambler can manage the ECM from this PID. Check if the descrambler may decipher an ECM. This method is invoked when a new ECM is received from a valid ECM stream which was validated by checkCADescriptor(). This method may perform additional checks on the ECM itself. But this method shall not attempt to decipher the ECM or submit it to a smartcard or perform any time-consuming processing. [in] ecm CMT section (typically an ECM). False if this ECM cannot be deciphered. True if it may be deciphered, altough it may fail when actually submitted. Decipher an ECM, return up to two control words, even and/or odd. By default (without --synchronous option), this method is executed in the context of a separate thread. It may take any necessary time to process an ECM, including submitting it to a smartcard. This method shall return either an odd CW, even CW or both. Missing CW's shall be empty. [out] cw_even Returned even CW. Empty if the ECM contains no even CW. [out] cw_odd Returned odd CW. Empty if the ECM contains no odd CW. True on success, false on error. Missing ECM's (odd or even) in the ECM shall not be considered as errors. Unable to decipher the ECM is an error. This hook is invoked when a new PMT is available. Implementation of PMTHandlerInterface. If overridden by a concrete descrambler, the superclass must be explicitly invoked. [in] table A reference to the new PMT. This hook is invoked when a complete section is available. Implementation of SectionHandlerInterface. If overridden by a concrete descrambler, the superclass must be explicitly invoked. [in,out] demux The demux which sends the section. [in] section The new section from the demux. Default stack usage allocated to CAS-specific processing of an ECM.